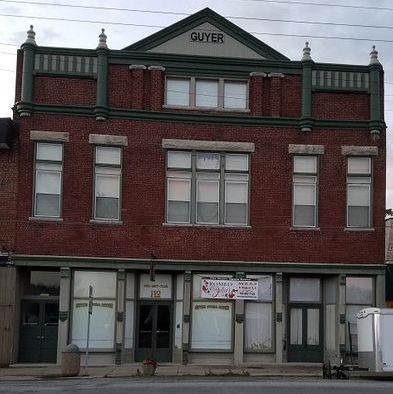 After recovering from our Revenant Acres Farm investigation, Dave, Trish and I got the opportunity to investigate The Guyer Opera House located in the small town of Lewisville, Indiana. We met our host, Jeff of Paranormal Indy, a little after 8pm. As we stepped into this historic building, I was taken aback at how beautiful it was on the inside. As you step into the main level you are greeted by a beautiful ticket booth. Further in they had tables set up for a party that was scheduled the following day. A staircase leads up to the magnificent theater section with plenty of seating and a stage. The dressing rooms are located behind the stage, all of which are still in use today for theatrical productions. Jeff graciously gave us a full tour of the building and the related history. In the 1890’s there was a massive gas explosion that took out the block. 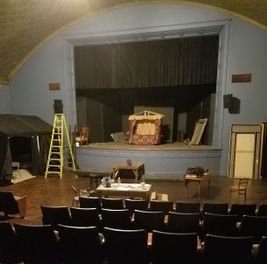 It was at this time of the rebuilding that Doctor Oscar Guyer brought the theater into town. The first floor originally housed a dry goods store. Apparently in the 1920’s a little boy, son of the merchant owner, was tragically killed in a shooting accident. It is believed that perhaps he still roams the building. The paranormal activity claims range from seeing apparitions, shadows, and being touched, just to name a few. To our great surprise, Jeff then led us to the building next door explaining that he was also able to provide us access to it as well! This building used to be a bank, and at one time also served as a funeral home. Currently, they are using it for overflow storage; it was an interesting area filled with fun costumes and furniture. After wrapping up the tour, Jeff sat down with us to show evidence he and his group had collected on their previous investigations. It was pretty compelling evidence! One of my favorite EVPs was of a little girl’s voice that was captured on a recorder at the old bank next door, nothing like hearing a child say “mommy” to tug at your heartstrings! Just before Jeff left us on our own accord to investigate, he mentioned I had a smile on my face during the whole tour. I had no doubt that I did, because I was struck with total awe from the start. The Opera House as a whole just had a magical feel about it. After setting up several video cameras in the Opera House, we went over to the bank building. We held an EVP and Spirit box session while in the basement of the building that consisted of limestone walls and a dirt floor. Trish had her K2 meter reacting strongly and strangely on an empty box. We spent time on the main floor with the Ovilus. The word “Mommy” came up, which made us all go “aww”. That was the same area Jeff had gotten his “mommy” EVP. The name “Murphy” came up, though I have no idea if there is any significance to that. At that point we eagerly made our way back to the Opera House and trekked up to the theater. I sat in the upper section while Dave and Trish were on the main floor. Trish’s meter was going strong, sometimes to red. My meter didn’t react until I moved it to the seat next to me, which took me by surprise to see it light up for the first time that night. As I moved it back to me it would stop. However when I moved it back to the seat, it would light. Perhaps there was another guest next to me? After our theatrical antics, I stayed in the theater while Dave and Trish went downstairs. I was surprised how quickly they returned when I heard them walking below me, but when I turned my flashlight on I was taken aback that they were not there! It was several minutes before they actually came back. I decided to stay in the theater with Trish while Dave ventured back to the staging area to look at some equipment. When Dave was there, he heard a male voice loudly yell “hey”. It was nearing 3 am, when we went back to the bank for a final time. While we were sitting in there, we all suddenly had a strange ringing in our ear! We were all fine when we left and reentered the opera house. After gathering up the video cameras, we all sat in the theater for a spell. We all heard a very loud noise but couldn’t tell where it came from. It was an entertaining night for us thesbian wanna be’s and as I walked through the door to exit the scene of our investigation, I realized I was still smiling! The theater has a beautiful old tin ceiling. Main floor room that is a party rental area. The stage is set for a performance, but perhaps the world isn't ready for a CAPS presentation quite yet! This is the old bank hallway, adorned with delightful costumes. This is the basement of the old bank where it is said that people have felt as if they are being touched. The dressing room area behind the stage. There have been sightings in the doorway area above. A pretty orb decided to make an appearance instead. The name "Bernie" came up in the Spirit Box session we had in the old bank. A mysterious loud noise was captured on the recorder left running alone in the basement. This was taken on the staircase that leads up to the theater. Sounds like "ugs"? At the one second mark, a childlike voice is heard talking over Trish in the Opera House. This was captured at the old bank. A whispery voice at 4 seconds, not sure what is said maybe "You forgot about this". A voice sounds like saying something like " Go Francine"? This was inside the Theater. Another theater EVP. Sounds like a voice says around 1 second"Tibia". Then at 3 seconds "No I'm not". These video clips come from one of our GoPix cameras sitting in the main theater. The first is something shooting down from the ceiling, associated with a clear noise after it passes the camera.